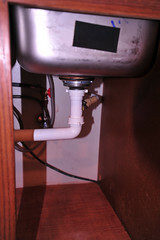 Last month I wrote about how we need a new dishwasher soon as our current 13-year old machine has sprung a small leak. We were alerted to the leak by a small water froggie device that I had placed under the machine. A while back, I got six of them from Woot. They’re as you might think, a small device that looks like a frog that beeps when the sensors on the bottom come in contact with water. I put the six devices around the house. Under the dishwasher, under the washer, next to the hot water tank (two), under the kitchen sink, and under the bathroom sink that gets used most often. For now, the dishwasher is still running. I have a lid from a plastic bin that I put under the dishwasher that catches the small amount of water that comes out. It actually evaporates pretty quickly, so although I check it every now and then, the leak hasn’t gotten any worse. I’m hoping for another three months as I know there are usually pretty good sales on appliances around Memorial Day. But, as it turns out, the water froggies have been busy! A couple of weeks ago, my wife called letting me know that there was a leak in front of the washing machine, and that the froggie under the machine was beeping. We have a front loading machine and we both assumed that this was because a piece of clothing got stuck in the door, something that happens now and then. Turns out, it wasn’t, as the next load caused another puddle. Upon further examination, a small piece of the rubber seal had broken off, so there was no longer a firm seal around the door. Luckily for us, we have an appliance repair plan through our gas company that services broken down appliances. We didn’t use it for the dishwasher because the thing is noisy as all heck, the insulation is broken down, and the motor sounds like it’s about ready to go so they probably wouldn’t fix it anyways as they won’t fix end-of-life appliances. But, they did fix the washing machine. So, we got a brand new rubber seal which took care of that problem. I commented to my wife that things always seemed to happen in threes, so we were due for another froggie going off. Since the water heater is also an original, I said that would probably be the next thing. Turns out, I was right about the ‘threes’ but it wasn’t the water heater. On Sunday, my wife was cutting up a bunch of vegetables for the week, including jumbalya that day and soup later in the week. I was downstairs in the basement in the play room and heard the disposal stop and start a few times. I registered that something didn’t sound right, but it didn’t really hit me that anything was wrong. Suddenly, she called me upstairs. She said that the disposal wasn’t draining. She had put a bunch of carrot peels down, and it was running, but it wasn’t draining. I know my wife knows how to run a garbage disposal (flip a switch) but I still figured I’d make sure she had covered the basics, so I walked over and hit the switch. The mess started to go down. I kind of smirked when suddenly, I felt water at my feet. And, then the water froggie started beeping. Turned everything off and opened the cabinet doors to find carrot-geddon had occurred. Apparently, the disposal did its work and crunched up the carrots but it wasn’t able to send them down the drain fast enough, so it clogged the u-pipe drain. I figure that stopping and starting the disposal created a vacuum effect similar to if we’d used a plunger. The pressure built and built until something had to give. Turns out, what gave was the clamp holding the various pieces of pipe together. It popped loose sending carrot peels and water everywhere. The fix was simple enough. Unscrew the other side of the pipe, take out all the carrot peels, rinse out the pipe, and run a shop vac to the rest of the line, trying to pull out any peels that had made it downstream. Put the pipe back, and re-fasten. The hard part was cleaning the finely minced carrot peels that had exploded everywhere under the sink. The shop vac took care of most of it but still, going back and cleaning every nook and cranny as well as wiping down every item that we stored under the sink, as well as clean up the floor that had seen the overflow….well all that took about two hours in total. And I’m sure we’ll still be finding carrot flakes until we rip out the cabinets despite my best effort. It wasn’t as catastrophic as having melted a hole in the floor, a story shared on Jana’s blog last week, but it definitely tried. So, when I commented that we were due for a third froggie beeping, turns out I was right, though just not on the one that would beep. Now that I got that right, let’s hope that these things go a good long time with silence. I’m tired of all these leaks!